Tom Hardy’s Venom project has been met with mixed reactions since the film’s announcement. Sony’s idea of a Spider-Man universe without Spider-Man is certainly… different. Current films slated in Sony’s spider-less Spiderverse include October’s Venom, Silver & Black, and Morbius. One thing that’s been nearly universally well-received is the comic-accurate look of Venom itself. Tom Hardy’s symbiote-infused anti-hero seems to be ripped straight out of a comic book, and Geek Motivation has come across information that will only help Venom’s comic-accurate look. 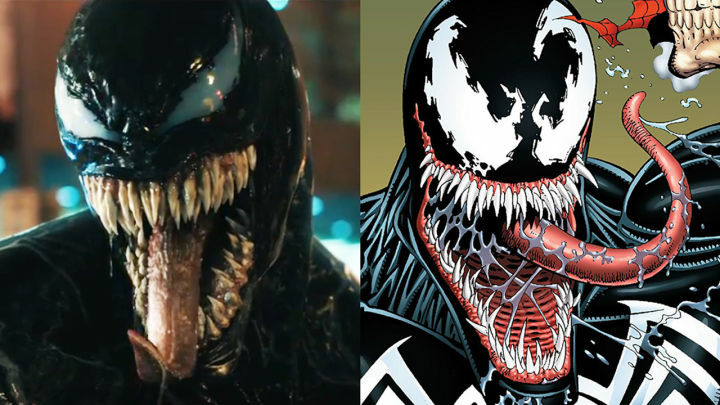 Venom’s movie look side-by-side with his comic look. Per an anonymous source close to the film, Venom will in fact have an emblem on his chest in his upcoming movie. This news is surprising, considering in our only full look at him (from the first trailer), there wasn’t any insignia on his body. Sort of an unclear look here, but we can see the symbiote making its way up Eddie Brock’s body. However, this is huge news when it comes to the comic-accuracy of Venom’s look. Through the years, Venom has seen a spider symbol similar to Spider-Man’s on his chest. Whether Venom actually ends up good or not, one thing’s for certain: the titular character is shaping up to look great. What do you think of the news that Venom will have a symbol on his chest in his new movie? Let us know on Twitter, and make sure you tune into our Weekly Review Periscope show on Wednesday, July 18 at 8:30 EST for a special announcement! Venom releases October 5, 2018.